The safety of ourselves, our coworkers, our customers and the public at large is first and foremost in our minds as we go about our day’s work. We work with electrical distribution lines both above and below ground, so using the proper personnel protective equipment (PPE) and following all safety procedures is critical. We also know that safety goes beyond that. It extends to safe driving and safe habits even around the office. For example, 70 R.B. Hinkle crews leave our facility each day between 5:45 and 6:15 a.m. in busy traffic to start their workdays. One employee, without being asked, has taken it upon himself to go out and direct traffic during the daily departure, helping to protect his coworkers from traffic incidents and bodily harm. Another employee was so safety-conscious while on a jobsite that the customer recognized him with their own “My Brother’s Keeper” safety award. We consider these to be definite examples of R.B. Hinkle employees going above and beyond the norm for safety. Acts of safety may be recognized by the R.B. 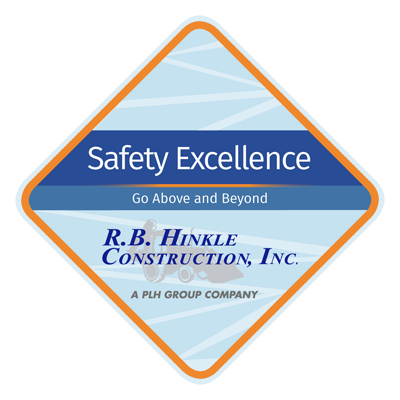 Hinkle safety director, executive management or foremen. 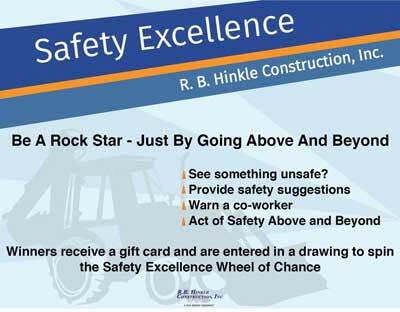 A winner is chosen each week from among employees who meet the Safety Excellence Program criteria. The weekly reward is typically a gift card from a restaurant, convenience store, sporting goods store or other retailer. Once a month, all eligible participants are entered in a random drawing. The drawing winner gets to park in the “Safety Excellence Winner” designated parking space — conveniently located closest to the building entrance — for the next month.